I have discovered that reading is learning and learning is discovering. Through my discovery of all things design, I have learned that true design and talent comes from a personal vision made into reality. Some of the products that I have come across have completely opened my eyes to the unlimited possibilites that we have as designers. 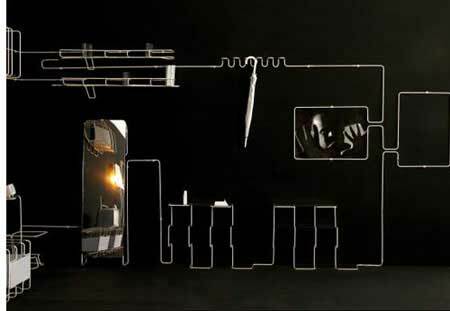 Aykut Erol designed a product called “Line.” Here he took a continuous peice of a metal wire system and bent it into various shapes all continuous within one piece. Promoted as a great piece of artwork for a long hallway, entry or corridor, it could contain everything from a mirror, lamp, coat rack, candle holder, etc. all within this single molded piece. It is pretty amazing that a piece of metal wire can be transformed into a masterpiece and a true piece of artwork. Design is unlimited… all you need is imagination and courage to make it happen!